When Lieutenant-Governor John Graves Simcoe shifted the capital of Upper Canada from Newark (today’s Niagara-on-the-Lake) to York in 1793, he rewarded government and military officials with generous land grants in the new capital (in part an attempt to sweeten the move from the existing capital). John Scadding (c.1754-1824), Simcoe’s secretary and manager of Simcoe’s Wolford Estate in Devonshire, accepted a grant of about 250 acres on the east side of the Don River, stretching from today’s Danforth Avenue south to the “broken front” of the lakeshore and east to Broadview Avenue (recorded as “lot 15 in the first concession from the bay” and the broken front). 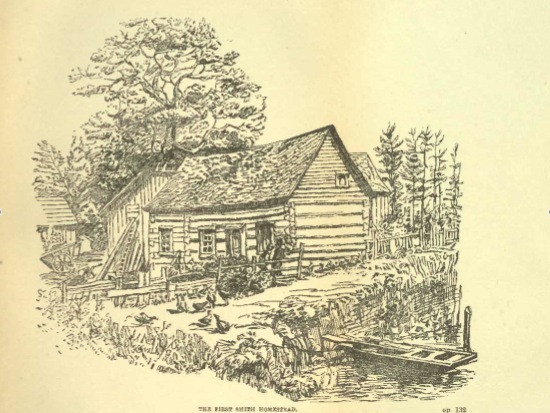 By 1794, Scadding had erected a small log cabin just south of today’s Queen Street east of the Don. John Scadding’s cabin. John Ross Robertson, Robertson's Landmarks of Toronto: A Collection of Historical Sketches of the Old Town of York from 1792 until 1833, and of Toronto from 1834 to 1893 (Toronto: J. Ross Robertson, 1894), vol. 1, 132. Toronto Public Library, TRL, 971.3541 R57. Licensed by Creative Commons. http://www.archive.org/details/landmarkstoronto01robeuoft, accessed 5 May 2009. Just two years later, in 1796, Scadding returned with the Simcoes to England, leaving Captain Playter’s son George to manage his holdings in his absence. He returned to Upper Canada in 1818 and shortly thereafter subdivided the southern half of his farm lot, laying out the land on the north side of the Kingston Road (Queen Street) in building lots of one to five acres. George Playter, his former caretaker, purchased the lot immediately east of the river, and a small group of houses and cottages grew up east of the bridge on either side of the Kingston Road. In 1819, William Smith Jr. bought all of Scadding’s land south of Kingston Road to the lakeshore and began construction of a tannery near the river. Scadding and his family continued to occupy his remaining holdings (from approximately Gerrard Street north to Danforth Avenue), constructing a larger house, barn, and stables for cattle and horses on the property north of today’s Gerrard Street. Around the homestead fields of… wheat, rye, barley, oats and maize were seen; and orchards containing a great variety of the finest kinds of apple and other fruits…. Asparagus beds and celery trenches were laid out; hemp was grown, and melons of all kinds…. In the flower garden bloomed most of the ordinary English flowers, especially roses of several species…. The [river] flats were converted into meadows, where sheep were to be seen, and all the usual domestic animals; and in convenient nooks here and there, stacks of hay (vol. 1, 194-95). In 1820 Scadding took over management of the Simcoe holdings on the west side of the river; the property was formally transferred to Scadding’s sons in 1833. Scadding was killed by a falling tree on his property in 1824. In 1856, his heirs sold the bulk of their remaining holdings—nearly 120 acres north of today’s Gerrard Street East—to the City for the future location of an “Industrial Farm, House of Refuge, and Jail for City and County.” Their decision would begin the shift in land use in the Lower Valley between Gerrard and Bloor/ Danforth away from agricultural and industrial uses and towards increasingly institutional designations. The area north of Riverdale Park and east of the Don was retained by Scadding family for some time, little subdivision occurring here until 1905. Scadding’s original cabin was removed from the property in 1879 and transferred to Toronto’s Exhibition grounds as an artifact of “pioneer life;” it still forms part of the permanent exhibition collection at the Canadian National Exhibition grounds in Toronto. Scadding’s cabin is the oldest known surviving building in Toronto. Scadding’s son Henry went on to become a noted teacher and clergyman. He wrote numerous religious, literary, and historical works, including his best-known book, Toronto of Old: Collections and Recollections Illustrative of the Early Settlement and Social Life of the Capital of Ontario (Toronto: Adam, Stevenson & Co., 1873; accessible through Google Books at: http://books.google.ca/books?id=vxYvAAAAYAAJ). Ontario Department of Planning and Development. Don Valley Conservation Report. Toronto: Ontario Department of Planning and Development, 1950. Robertson, John Ross. Robertson's Landmarks of Toronto: A Collection of Historical Sketches of the Old Town of York from 1792 until 1833, and of Toronto from 1834 to 1893. Vol. 1. Toronto: J. Ross Robertson, 1894.